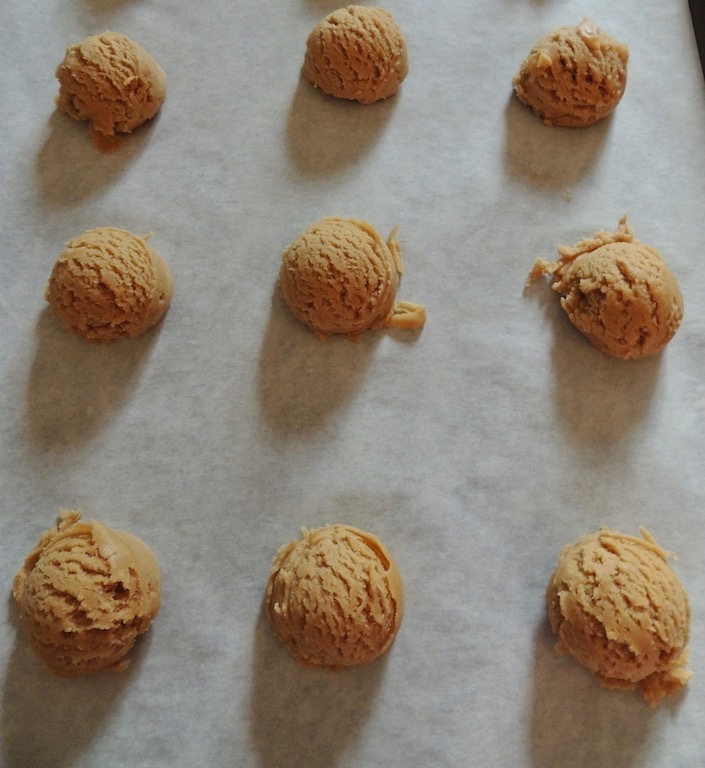 Peanut butter cookies are a classic, popular with both children and adults. It’s also a cookie that just screams for a cold glass of milk. Use my recipe for strawberry ice cream to make PB&J ice cream sandwiches! Scoop 4 ounces of ice cream onto the back of a cookie and gently press down with another cookie on top. I like to use natural peanut butter, creamy or crunchy. It doesn’t have the added sugar and oil, retaining more of its natural flavor. Natural peanut butter comes separated, the oil on top and the solids on the bottom. It’s not an easy task to mix it together in the jar, so I scrape it into a food processor and in seconds, it’s completely blended. 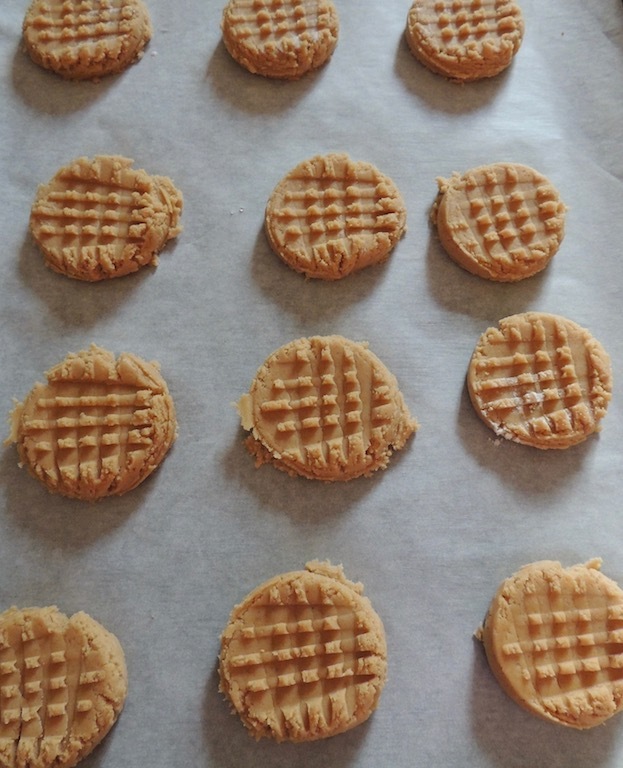 This peanut butter cookie recipe is quick and easy to make. Preheat the oven to 350 degrees F and line a couple of baking pans, such as this 13-inch by 18-inch half sheet pan with parchment or a silpat mat. Beat the butter in a mixer on high until fluffy. Add the white and brown sugars and beat until incorporated, stopping to scrape the sides two or three times. It’s important the sugar become embedded in the butter, which melts in the oven and the steam acts as a leavening agent. 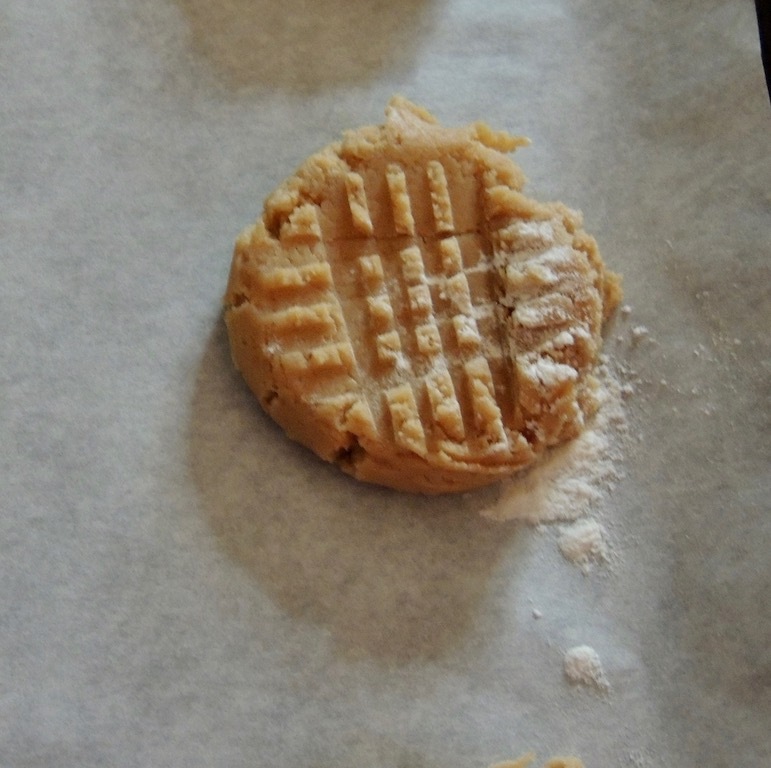 The baking powder is a leavening agent, but the cookie is dense and the sugar has more of an impact. Add the eggs and beat, scraping the sides several times, until well blended. Add the peanut butter and vanilla, beat to combine. Finally, add the flour and baking powder. Start at a low speed to prevent the flower from spraying all over. Scrape the sides a few times. Once the batter looks blended, scrape the sides one more time and then beat on high for 15 seconds to smooth out the batter. I like to use a small, 2 ounce or 2 tablespoon, ice cream scoop to form the cookies. It makes the cookies uniform in size. Place each scoop about 2 inches apart on the baking sheet. Recipe makes about 30 two-inch in diameter cookies. Place a spoonful of all-purpose flour in a small bowl or on a small piece of wax paper. Dip a dinner fork in to the flour, shake to eliminate any excess flour or your cookie looks like this! Gently press down on the cookie to impress the fork tines. Be sure to dip the fork into the flour every couple of cookies to prevent sticking. Turn the baking sheet 90 degrees and press with the fork again to create the traditional crisscross marks on the cookies. Bake in the preheated oven for 20 minutes. Cool and store in an airtight container. Preheat the oven to 350 degrees F and line a couple of baking pans, such as this 13-inch by 18-inch half sheet pan with parchment or a silpat mat. Add the eggs and beat, scraping the sides several times, until well blended. Add the peanut butter and vanilla, beat to combine. Place a spoonful of all-purpose flour in a small bowl or on a small piece of wax paper. 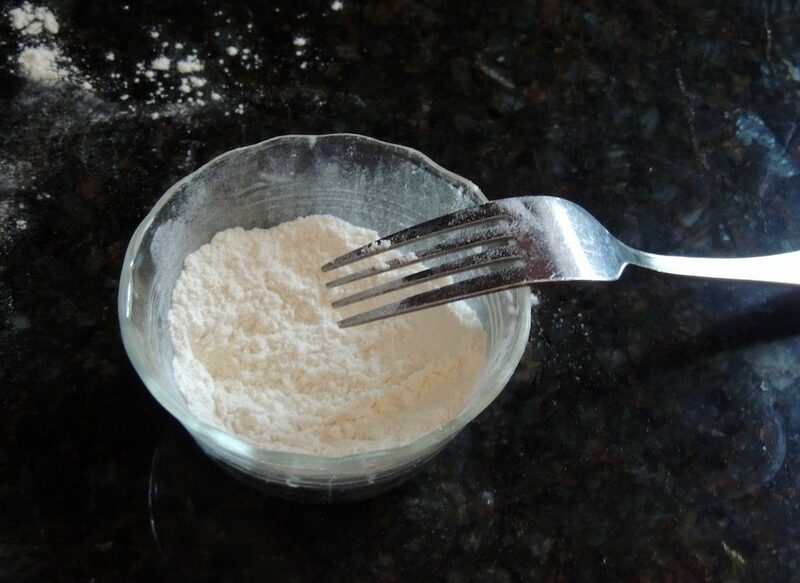 Dip a dinner fork in to the flour, shake to eliminate any excess flour or your cookie looks like this!